Griffith University researchers have developed a system that can quickly detect airborne biological threats. Professor Igor Agranovski, of the School of Engineering, has developed a system that collects aerosolised micro-organisms and finds the threats, such as fungi spores, viruses and bacteria. Such a system could be crucial to soldiers in the field or post-event investigations. The researchers won contracts with the Australian Defence Force (ADF) through the Defence Innovation Fund to complete the prototyping of the system. It follows on from Professor Jin Song Dong’s contract in June to develop autonomous underwater vehicles. Aerosolisation is when a physical substance is converted into particles small and light enough to be suspended and transmitted in the air. That could be through a spray, like and aerosol nebuliser, or through a natural process, like a sneeze or cough. “I started my research in the area of bioaerosols in the year of 2000 in collaboration with colleagues from the University of Cincinnati, USA,” Professor Agranovski said. “When the system is complete and being used it will be capable of early detection of presence on airborne pathogenic microorganisms, enabling more timely use of personal protective equipment (PPE) and the launch of corresponding sanitary and quarantine actions. Griffith Enterprise has been working closely with several researchers whose work could have defence application for a number of years. The Defence Innovation Hub was launched in December 2016, and has invested around $20 million in industry and research organisations across Australia to mature and further develop defence technologies. Its expects to spend a total of $1.6 billion. Minister for Defence Industry, Hon Christopher Pyne announced the new projects as boosts to ADF capability. “These investments will drive growth in defence industry and innovation whilst focusing on the capability needs required to ensure Australia’s national security now and into the future,” Minister Pyne said. Researchers in Illinois have used a smartphone in conjunction with a credit-card-sized test kit to diagnose four respiratory diseases in horses. The low-cost, portable, smartphone-integrated system is said to be able to address the challenges of diagnosing infectious diseases in resource-limited settings, or in situations where a result is needed immediately. The system has reportedly achieved detection limits comparable to those obtained by laboratory-based methods and instruments, in about 30 minutes. Findings published in Analytical Chemistry showed the system was able to detect four horse respiratory diseases – equine herpesvirus-1, equine herpesvirus-4, Streptococcus equi, and S. Zooepidemicus. A related report in Biomedical Microdevices explained how the system was used to detect and quantify the presence of Zika, Dengue, and Chikungunya virus in a droplet of whole blood. For the research effort, horses were used as an animal model for respiratory diseases in man and in food animals. The team of researchers is working on a next-generation chip that will have four more tests available. “You can often more easily develop diagnostic tools for human use by coming in to development from the animal side of things first,” explains Dr David Nash, a key researcher involved in the project. “Many diseases show up first in animals, kind of the canary in the coal mine,” says Nash, who is a private practice equine expert and veterinarian in Kentucky. Discussing the financial impact of infectious disease outbreaks in horses, he says: “It’s costly to horse owners and trainers, and disrupts the business operations of all equine sports. “Consider this — on December 25, 2016 a single horse stabled at the Fair Grounds Race Course in New Orleans experienced a fever and subsequently developed neurological symptoms. “The state diagnostic lab was 100 miles away and was closed for the Christmas holiday. The end result was an equine herpesvirus-1 (EHV-1) outbreak that resulted in the quarantine of over 200 horses at the racetrack and a serious financial loss for horse owners and the racetrack owner. The technology is intended to enable clinicians to rapidly diagnose disease in their office or in the field, resulting in earlier, more informed patient management decisions, while markedly improving the control of disease outbreaks. The system uses a commercial smartphone to acquire and interpret real-time images of an enzymatic amplification reaction that takes place in a silicon microfluidic chip that generates green fluorescence and displays a visual read-out of the test. The system is composed of an unmodified smartphone and a portable 3D-printed cradle that supports the optical and electrical components, and interfaces with the rear-facing camera of the smartphone. The software on the smartphone gathers information about the tests conducted on the microfluidic card, patient-specific information, and the results from the assays, that are then communicated to a cloud storage database. “This project is a game changer,” says Nash. “This is the future of medicine – empowered front-line healthcare professionals. We can’t stop viruses and bacteria, but we can diagnose more quickly. “We were able to demonstrate the clear benefit to humankind, as well as to animals, during the proposal phase of the project, and our results have proved our premise. Importantly, the system is capable of detecting multiple nucleic acid targets at the same time and, thus, is capable of identifying coinfections of multiple pathogen strains. By generating a positive/negative determination of the presence of specific pathogens, the mobile system can assist physicians in rapid point-of-care decision-making for treatment and quarantine response that is currently not possible with tests performed at central laboratory facilities. The multidisciplinary group inolved in the project included personnel from University of Illinois at Urbana-Champaign and the University of Washington at Tacoma. Uusitalo developed the optical detection of microbial cells using Raman spectroscopy to increase measurement sensitivity via SERS (surface-enhanced Raman scattering) amplification. SERS measurement is based on Raman scattering, whose intensity is increased by the oscillation of free electrons in metal. In some cases, the method can identify a sample to a precision-level of one molecule. The disposable SERS measuring substrate is patterned using a roll-to-roll production method and coating the substrate with thin gold plating. "The more sensitive the SERS process becomes in the case of challenging cell measurements, the more applications it will have in the future. It would provide a fast and simple method of microbial identification compared to traditional cell cultures and enable the fast identification of microbes in cases, say, of food poisoning, or rapid purity analysis in food industry production facilities," says Uusitalo. Uusitalo's doctoral thesis, "Detection of small molecules and microbial cells by surface-enhanced Raman spectroscopy using roll-to-roll produced substrates", which focuses on Raman spectroscopy, will be examined at 12 noon on 24 November at the University of Oulu. VTT Technical Research Centre of Finland Ltd is the leading research and technology company in the Nordic countries. We use our research and knowledge to provide expert services for our domestic and international customers and partners, and for both private and public sectors. Medical University of Vienna researchers have shown that a Roche PCR test has superior sensitivity rates and can more rapidly identify pathogens in the blood of neonatal patients than traditional blood culture testing. As a result, the researchers deemed the Roche SeptiFast Mgrade PCR test using a modified DNA extraction protocol acceptable for rapid detection of neonatal sepsis alongside conventional blood culture. The researchers published their findings last week in the journal PLOS One. Sepsis is among the leading causes of neonatal mortality, and prematurely born neonates experience the highest incidence and mortality of sepsis among all age groups, according to a review published last year in Current Opinion in Pediatrics. The review noted that in the US, 36 percent of neonates born before they have completed 28 weeks of gestation "suffer at least one episode of a bloodstream infection during their birth in hospitals, with up to a 50 percent associated mortality." "Routinely, hospitals hold a low-birth-weight baby and start them on prophylactic antibiotic treatment while drawing cultures during the first 48 hours," Darshna Tanna, Roche's lifecycle leader for microbiology, said in an interview. "The quicker you can rule out a bacterial infection, the quicker you can get babies off empirical treatment and out of the neonatal intensive care unit." The researchers in Vienna prospectively analyzed 212 episodes of suspected late-onset sepsis in neonatal patient samples using the SeptiFast diagnostic test with the modified DNA extraction protocol. They compared the results with those from blood culture, laboratory biomarkers, and clinical signs of sepsis. Using a blood volume of 100 μL, the test demonstrated a sensitivity of 90.2 percent "for the diagnosis of blood-culture positive sepsis episodes; a moderately high number of positive test results in episodes without infection potentially due to contamination during blood drawing and processing; and an increased pathogen detection rate in patients with clinical sepsis," the researchers said. "The most important message in this study is that there is great need for a rapid and adequate treatment of neonatal sepsis in order to reduce the leading causes of mortality of preterm babies," Tanna said. "Methods in the past have been based on adult requirements of blood, ranging from 5 to 10 mls per bottle, but this study has been able to show that a modified DNA extraction yielding 100 μL is sufficient for the rapid, molecular detection of bacterial pathogens." The time to detection for the Roche test is within 5 to 6 hours, and traditional cultures require at least 48 to 120 hours to yield a positive result, Tanna said. She noted that other PCR technologies offer targeted panels but don't offer the level of multiplexing and pathogen spectrum that is available on the SeptiFast test, which detects and identifies the 25 most common pathogens known to cause to blood stream infections and is designed to be run on the company's LightCycler 2.0 qPCR platform. In neonatal sepsis testing, the gold standard for many years has been traditional blood culture testing, which takes longer and requires more blood than physicians would like, Tanna said. "You can imagine that a tiny, premature baby has a limited amount of blood to offer and there is the added difficulty of a peripheral venipuncture on such a tiny individual," Tanna noted. "A routine sepsis workup requires sampling of blood for cultures, hematology, and clinical chemistry. Therefore, any method that offers the possibility of collecting less blood is welcome to these patients." The study by the Vienna researchers recommends that blood culture be used along with PCR in testing neonates for sepsis. "In this study, clinicians are using SeptiFast as an additive test, so they are continuing to use blood culture testing, the gold standard, but when they add the use of SeptiFast the sensitivity of the test rises from 50 percent to 90 percent," Tanna noted. SeptiFast has received CE marking and is available in Europe and other countries that accept the mark, but it is not commercially available in the US. Roche said it doesn't have plans to seek US Food and Drug Administration clearance for the test, but that SeptiFast is one among a portfolio of diagnostic products it is offering and developing to combat the growing rate of sepsis infections and to combat antimicrobial resistance that can occur from over prescription of antibiotics. The firm markets assays for its fully automated Cobas 4800 real-time PCR system that target and identify antibiotic resistant organisms such as MRSA, C. difficile, and vancomycin-resistant organisms. 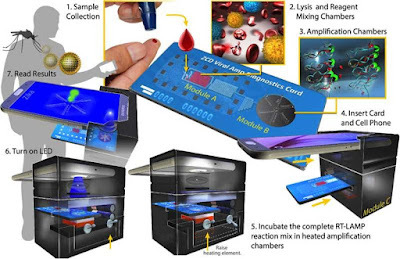 Additionally, the company provides sepsis biomarker tests that run on its Elecsys electrochemical analyzer, including c-reactive protein, interleukin-6, lactate, and procalcitonin, which is perhaps the most important marker according to Tanna and "has a very high negative predictive value and sensitivity to bacterial infections." The Vienna researchers in their study cautioned that the benefit of rapid pathogen detection "has to be balanced against the considerable risk of contamination, loss of information on antibiotic sensitivity pattern, and increased costs." PCR and other molecular technologies are likely to be most effective in neonatal sepsis and general sepsis diagnosis and treatment when they are paired with a phenotypic antibiotic sensitivity analysis tools that analyzes the sensitivity of a pathogen to an antibiotic treatment, Tanna noted. "To identify the correct pathogen and get the right drug-bug combination, you want to know what type of antibiotic to use, its concentration for the patient, and the length of time it should be administered," she said. For that, Roche is developing Smarticles technology that consists of DNA-delivery bioparticles combined with custom-designed DNA molecules that cause live bacteria to produce light. In the presence of antibiotics, susceptible bacteria targeted by bioparticles will remain dark, while drug-resistant bacteria produce light quickly and efficiently, Roche said. The firm purchased Smarticles technology with the acquisition of GeneWeave BioSciences in 2015. The technology is not yet commercially available, and Roche did not provide a timeline for its expected release. In the market for sepsis testing, Roche has several competitors that offer a combination of molecular and immunochemistry assays, including established companies such as BioMérieux and Thermo Fisher Scientific, and emerging firms such as T2 Biosystems and Accelerate Diagnostics. In September, T2 said it had filed a 510(k) premarket submission for its T2Bacteria Panel with the US Food and Drug Administration. The panel runs on the FDA-cleared T2Dx instrument and identifies pathogens associated with sepsis within hours instead of days, T2 Biosystems said at the time of its submission. In February, the FDA cleared Accelerate Diagnostics' test kit and instrument platform for identifying organisms that cause bloodstream infections. Similar to Roche's Smarticles technology, the kit provides information about antibiotic sensitivity. It can identify bacteria or yeast from a positive blood culture in about 1.5 hours. Roche is "looking internally at several technologies to do direct-from-sample identification of pathogens," in the context of sepsis diagnosis and treatment, Tanna said. She also noted that the firm had recently inked an R&D agreement with Inotrem to collaborate on developing a companion diagnostic test for a septic shock treatment in clinical trials. Indian scientists have developed a new sensor-based technique for detecting the presence of S. pyogenes bacteria, the most common cause of throat infections. It is claimed to be a quick and cost-effective. “The aim was to develop a rapid, accurate, sensitive, specific and cost-effective method for detection of S. pyogenes. The current methods of detection S. pyogenes infection are culture test, biochemical assays, polymerase chain reaction, genetic markers. And these methods are time-consuming, expensive, are unable to pick up the bacteria if present in small numbers and may even wrongly identify other bacteria as S. pyogenes,” Professor Ashok Kumar from the Institute of Genomics and Integrative Biology, who led the research, told India Science Wire. The most common cause of throat infections in humans is S. pyogenes bacteria. If left untreated it may damage human heart valves resulting in a severe form of rheumatic heart disease. Early diagnosis can prevent damage of human heart valves by taking timely and correct medical care. Several infectious pathogens are found in human whose detection is essential for rapid cure of diseases. The most commonly found pathogen in human is Streptococcus pyogenes which leads to a wide range of infections from mild pharyngitis to rheumatic heart disease. An ultrasensitive DNA chip based sensor was developed for quick identification of pathogen S. pyogenes from patient throat swab samples. The amperometric response was measured after hybridization of specific probe with single stranded genomic DNA (ssG-DNA) from the patient samples. The DNA chip was characterized by FTIR, SEM and validated with suspected patient real samples. The sensitivity of the DNA chip based sensor was found 951.34 (μA/cm2)/ng DNA and lower limit of detection (LOD) was 130 fg/6 μL samples. The DNA chip based sensor is highly specific and takes only 30 min for identification of specific pathogen. Infectious disease is still the biggest causes of human death and disability worldwide, and are a particularly acute problem in developing countries where easy access to clinics equipped with up-to-date diagnostic equipment is often limited. But the rapid spread of smartphones has put advanced technology into the hands of many more people, and leveraging their capabilities for healthcare applications has become a subject of great interest. The US team, spread across electrical engineering, bioengineering and mathematics departments at the Universities of Illinois at Urbana-Champaign and the University of Washington at Tacoma, developed a lab-on-a-chip system that can be mounted on a very portable credit card-sized carrier and read by the camera on an unmodified smartphone, providing diagnostics almost as sensitive and accurate as those of clinic-based equipment but potentially at a fraction of the cost. Moreover, the team claims, it can distinguish between diseases with similar symptoms, allowing the right treatment — or quarantine, if necessary — to be administered quickly. The team was led by two Illinois professors, electrical engineer Brian Cunningham and bioengineer Rashid Bashir, and Tacoma Prof David Hirschberg, affiliated with science and mathematics at the School of Interdisciplinary Arts and Sciences. Also on board was Ian Brooks of the National Centre for Supercomputing Applications in Urbana-Champaign, and David Nash, a Kentucky-based specialist in respiratory diseases in horses. “You can often more easily develop diagnostic tools for human use by coming in to development from the animal side of things first,” Nash explained. “Many diseases show up first in animals, kind of the canary in the coal mine.” Moreover, he stressed, disease outbreaks in horses are a major financial drain on a locally-important industry, and as diagnostic labs tend to be far apart, there is a need for this kind of technology. 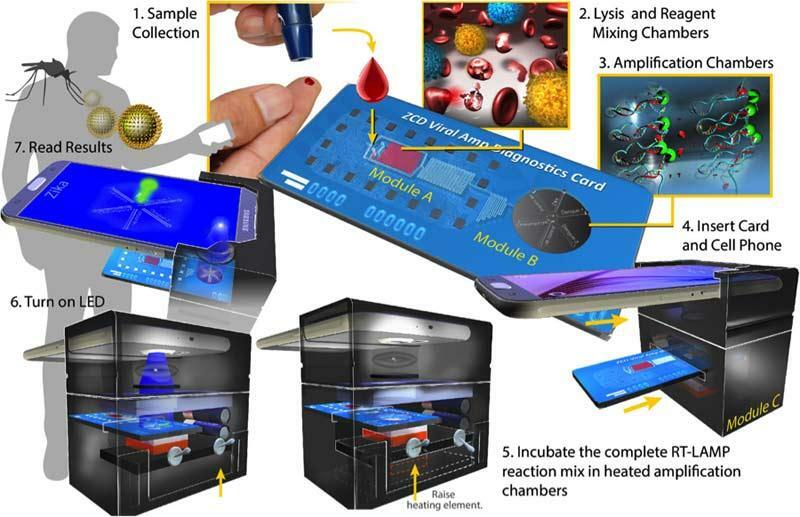 The lab-on-a-chip is equipped to carry out enzymatic tests on small samples of blood or sputum, and indicates results by inducing a green fluorescence that can be easily detected by a standard phone camera. The card is accompanied by a 3D-printed cradle that contains optics and electronics and holds the card and the phone at the optimum distance with the rear-mounted camera of the phone positioned over the chip’s readout section. Software on the phone gathers information about the tests on the card, patient-specific information, and uploads the test results to a cloud server. The project’s results have been published in two papers. In Analytical Chemistry, the team describes detection of four equine diseases, and in Biomedical Devices, they discuss how the system detected and quantified the presence of three mosquito-borne viruses — Dengue fever, Zika and Chikungunya, which all have similar early symptoms but different outcomes and require specific treatment— from a single drop of whole blood. What’s more, he added, it could not have been done without a multidisciplinary team. “I can’t envision going into a project without engineers now,” he said. Rapid Micro Biosystems, a leading provider of automated, non-destructive, rapid microbial detection, is pleased to announce the receipt of a $7.3 million contract from the Biomedical Advanced Research and Development Authority (BARDA) for the implementation of a rapid sterility test for vaccines. This awarded grant is part of BARDA’s Advance Development of Medical Countermeasures for Pandemic Influenza, which focuses on improving the government’s responsiveness to future pandemic threats. When combined with Rapid Micro Biosystems’ automated Growth Direct™ detection system, the rapid sterility test will result in faster release of vaccines and other sterile products. Timely delivery of these products carries multiple public benefits, principally in facilitating rapid responses to pandemic or emerging infections, agents of bioterrorism, and availability of life saving medicines. “Our continuing relationship with BARDA demonstrates the critical need for rapid sterility testing as part of our response to immediate health threats,” said Robert Spignesi, Chief Executive Officer at Rapid Micro Biosystems. “Our unique detection technology will show contamination within hours and will provide results in half the time of the traditional 14-day test,” said Edward Ognibene, Vice President Development at Rapid Micro Biosystems. The team at Rapid Micro Biosystems has extensive experience in product development, manufacturing, and service of rapid microbial quality control products, and has previously worked successfully with BARDA to develop the fundamental technology for a rapid sterility test. Upon completion of the program, the resulting product will make valuable improvements to the quality control release of sterile vaccines and other lifesaving pharmaceutical products and will immediately benefit the public. Quidel Corporation (“Quidel”), a provider of rapid diagnostic testing solutions, cellular-based virology assays and molecular diagnostic systems, announced today that it has received 510(k) clearance from the United States Food and Drug Administration (FDA) to market its Sofia Lyme FIA for the rapid differential detection of human IgM and IgG antibodies to Borrelia burgdorferi from serum and plasma specimens from patients suspected of B. burgdorferi infection. The test is intended for use with the Sofia analyzer to aid in the diagnosis of Lyme disease. “With the clearance of the Sofia Lyme FIA, we are now able to detect the microorganism associated with Lyme disease more rapidly in near patient settings. This is another example of our ability to provide simple, cost-effective solutions for physician offices and hospitals that previously had to wait several days for send-out Lyme results,” said Douglas Bryant, president and chief executive officer of Quidel Corporation. The Sofia analyzer and Sofia Lyme FIA combine unique immunofluorescence chemistry, advanced lateral flow technology, and failure alert and fail-safe systems designed to ensure reliable, objective, diagnostic results within 10 minutes of application of the patient's specimen. The Sofia Lyme FIA is the first to provide differentiated results for both IgM and IgG on a single test. Wormser, G. P., Dattwyler, R. J., Shapiro, E. D., Halperin, J. J., Steere, A. C., Klempner, M. S., Nadelman, R. B. (2006). The Clinical Assessment, Treatment, and Prevention of Lyme Disease, Human Granulocytic Anaplasmosis, and Babesiosis: Clinical Practice Guidelines by the Infectious Diseases Society of America. Clinical Infectious Diseases, 43(9), 1089-1134. Aguero-Rosenfeld, M. E., Wang, G., Schwartz, I., & Wormser, G. P. (2005). Diagnosis of Lyme Borreliosis. Clinical Microbiology Reviews, 18(3), 484-509. Luminex Corporation announced that it has received FDA clearance for the ARIES® Group A Strep Assay, a moderate complexity, sample to answer test for the direct detection of Streptococcus pyogenes from throat swab specimens using the ARIES® System. This is the sixth assay the FDA has cleared for use on Luminex's ARIES® Systems in the last 24 months. Fast and accurate diagnosis of Group A Streptococcus infections is critical to ensuring that appropriate antibiotic therapy is started promptly. For example, accurate diagnosis of Group A β-hemolytic Streptococcus pyogenes is crucial for determining the optimal treatment since physical examination alone is not sufficient to distinguish between pharyngitis caused by Group A β-hemolytic Streptococcus pyogenes and viral pharyngitis, or non-GAS bacterial organisms such as Fusobacterium necrophorum. Invasive cases of this infection lead to as many as 1,600 deaths in the United States each year, according to CDC estimates. Dr. Ted E. Schutzbank, Technical Director, Specialized Testing and Microbiology at Ascension/St. John Providence added: "While the use of rapid antigen detection kits has been the standard of care in physicians' offices for years, the sensitivity of these tests has always been questionable, requiring follow-up testing of negative results, typically by bacterial culture. Delaying treatment while awaiting lab results can lead to serious short-term sequelae such as scarlet fever, or long-term complications such as rheumatic fever. Replacement of rapid antigen testing by the ARIES® Group A Strep Assay will allow for a much faster definitive diagnosis of these infections and greatly enhanced patient care by ensuring timely administration of antibiotic therapy." Water quality monitoring currently occurs mainly at water supply intakes or water treatment plants, rather than along water distribution lines or at the point of use. This is inadequate because negative changes can occur in water quality between the water source and your faucet. It is essential to monitor this key natural resource for various contaminants, such as toxic heavy metal ions, within water distribution and treatment systems. Accurate and accessible detection technologies are necessary to ensure continuous water quality control and early warning capabilities to avoid public safety catastrophes like the ongoing Flint water crisis in Michigan. During the AVS's 64th International Symposium & Exhibition, being held Oct. 29-Nov. 3, 2017, in Tampa, Florida, Junhong Chen, distinguished professor of mechanical engineering, materials science and engineering at the University of Wisconsin-Milwaukee, will present his work about inventing a graphene-based sensing platform for real-time, low-cost detection of various water contaminants. The new sensor detects heavy metals, bacteria, nitrates and phosphates. "Our technology addresses an unmet need for real-time, low-cost monitoring of critical contaminants in drinking water," said Chen. "Water plays an important role in the economic world, but only 3 percent of the available water is potable, and with increasing demand, the need for safe drinking water is rising." Graphene, a single layer of carbon atoms arranged in a 2-D honeycomb lattice, is a promising nanomaterial thanks to its unique structure and electrical properties. "Intrinsic graphene is a zero-gap semiconductor that has remarkably high electron mobility (100 times greater than that of silicon), which makes it attractive for sensitive, high-speed chemical and biological sensors due to its high sensitivity to electronic perturbations," he said. The sensor works by placing graphene-based nanosheets that are semiconducting between an electrode gap. The electrical conductivity of the graphene material changes with the binding of substances, called analytes, to its surface and their chemical constituents are identified and measured. "The magnitude of the conductivity change can be correlated to the concentration of analyte, and the technology also involves the functionalization of the graphene material surface with specific probes that can target a specific analyte," said Chen. The sensor is based on a field-effect transistor (FET) device with reduced graphene oxide (rGO) as its sensing channel. "The working principle of the sensor is that the rGO conductivity (usually measured in resistance) changes with the binding of chemicals such as heavy metals to probes anchored on the rGO surface," he said. "So the presence of the chemicals can be determined by measuring the sensor resistance change." By deploying these real-time sensors to monitor water contaminants in water distribution systems, according to Chen, they could provide early warning of chemical and biological contamination in water, improving water safety and public health benefits. "The platform technology can also be further engineered to detect various analytes for food and beverages, as well as for biomedical applications," said Chen. Chen has launched a startup, NanoAffix Science LLC, to commercialize his water-quality sensing technology. With funding from the National Science Foundation and in partnership with several water companies, they've already developed a prototype of a hand-held device for rapid, low-cost detection of lead ions in drinking water. "We're now refining the prototype to make it a commercial product in the near future," said Chen. A novel assay using host-based biomarkers distinguished bacterial from viral infections in a double-blind evaluation of its accuracy in children presenting to emergency departments and admitted to inpatient settings. "Bacterial and viral infections often present with similar clinical symptoms," Issac Srugo MD, Department of Pediatrics, Bnai-Zion Medical Center, Haifa, Israel, told MD Magazine. "Accurate, rapid and actionable diagnostic tools that can distinguish between the two can help physicians to make better informed antibiotic treatment decisions." Srugo and colleagues explain that targeting host proteins allows for rapid and quantitative measurements, using well-established technologies. The new host-signature assay (ImmunoXpert, MeMed Diagnostics) identifies 3 host proteins: the viral-induced tumor necrosis factor-related apoptosis-inducing ligand (TRAIL) as well as interferon y-induced protein-10 (IP-10), and the traditional bacterial-induced protein CRP. The proteins routinely used to support diagnosis of infection, procalcitonin (PCT) and CRP are subject to interpatient variability, according to Srugo and colleagues, and even when considered along with white blood cell count (WBC) and absolute neutrophil count (ANC), often yield equivocal results. The researchers evaluated the new assay using serum remnants collected at 5 pediatric emergency departments (ED) and 2 inpatient wards from febrile children aged 3 months to 18 years presenting with acute infection from bacterial (68), viral (239) or indeterminate (54) pathogens. The reference diagnoses were confirmed through a consensus of 2 or 3 persons of a 3-person panel after their independent review of the medical records. "There is no single gold standard for broadly determining the underlying etiology for acute infection," the researchers noted. The panel of experts utilized predetermined criteria consistent with accepted assessment and diagnostic guidelines, and were blinded to the diagnosis of their peers and to the host-signature assay results. The levels of TRAIL and IP-10 were found to be significantly higher in children with viral as compared with bacterial infections: mean (SD) levels of TRAIL 139 (122) versus 52 (27) pg/ml; and IP-10 levels of 1011 (626) versus 845 (677) pg/ml. The CRP were significantly lower in children with viral than with bacterial infection: 31 (32) versus 165 (108) mg/L. The host-signature assay exhibited the most pronounced difference, with mean viral patient score of 20 (24) vs 85 (23) for patients with bacterial infection. The assay distinguished between bacterial and viral patients with 93.8% sensitivity and 89.8% specificity; with an equivocal outcome in 11.7% of cases. These results were superior to CRP (88.2% sensitivity, 73.2% specificity) and PCT (63.1% sensitivity, 83.2% specificity). "The robustness of the host-signature is likely explained by the distinctive and complimentary viral- and bacterial-induced expression dynamics of the 3 constituent host proteins," the researchers indicated. Srugo anticipates that the new assay will be found useful and widely adopted. "There is no doubt that development of more rapid (within minutes) and easy to use formats of the assay suitable for the ED and the doctor's office would be valuable, and indeed are underway," Srugo said. "Determining the infection etiology during the patient visit can ensure bacterial infected patients receive timely therapy and reduce prescriptions to viral patients for whom antibiotics do nothing to speed recovery, while causing harm to the larger community." The study, "Validation of a Novel Assay to Distinguish Bacterial and Viral Infections," was published online in the Journal Pediatrics last month.